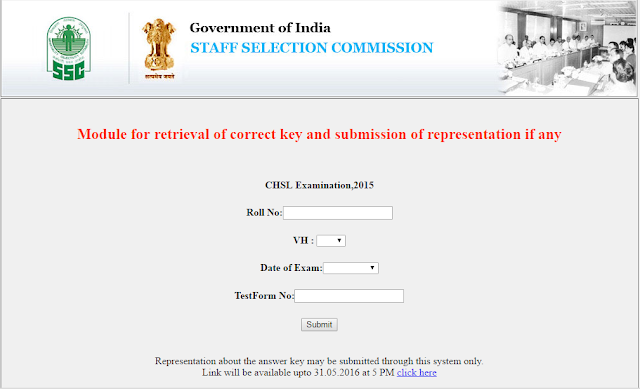 SSC has released the official answer key of the written examination of Combined Higher Secondary Level (10+2) Examination 2015. This exam was conducted on 01.11.2015, 15.11.2015, 06.12.2015 and 20.12.2015. Candidates may go through the answer keys corresponding to their Test Form and send representations, if any, by 5.00 PM on 31.05.2016. You need your Roll Number, Date of Exam and Test Form Number for viewing the answer key of your set. Click on below given link to check the official answer key.